1948 Deluxe Super 8 LWB "Sedan for Seven"
Meet the "The Queen" a 1948 Deluxe Super 8 LWB "Sedan for Seven"
The "Queen", Queen of the Fleet, is the first acquisition in our current collection, but it was actually preceded by a '52 200 Deluxe and a '46 Custom Clipper. I think it joined our family in late 1979. It has an interesting history, all based in Houston. It was sold new at Meador Motor Company in Houston which was also the Packard distributor for the southern half of Texas. According to the title, it was sold to a fellow by the name of Howard Torrible. I assume he had something to do with the local Gray Line Tour franchise business. It served as a VIP limo taking visitors from the old Houston Municipal Airport, now Hobby, to the Rice and Shamrock Hotels. Gray Line had the airport limo franchise at the time and they had three of these lwb, long wheel base, Packards and two lwb Chryslers. The old art deco terminal has been restored and they occasionally ask us to bring the Queen out for special programs etc. Our "sedan for seven" as they are officially called by Packard, had very low mileage as it had been reserved for VIP service and did not make daily trips into town as the other four sedans did. These five cars were used by Gray Line in this capacity from 1948 until 1955. In '55 the new terminal opened and new vehicles were acquired for the service. 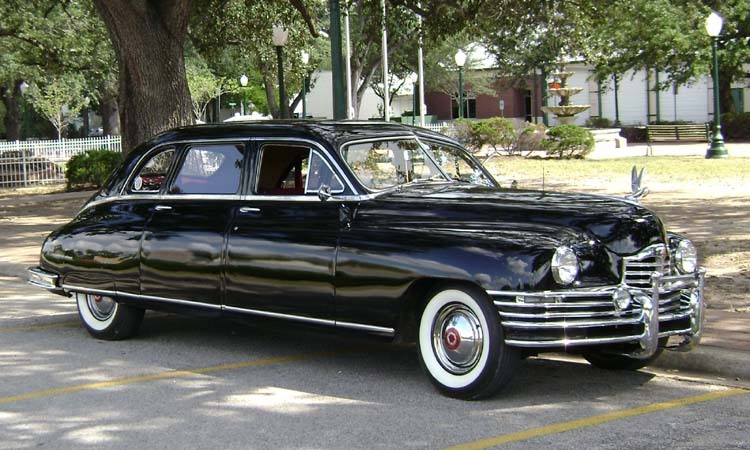 Long time Houston Packard collector, Jim Tagliabue (now deceased) bought all five of the lwb cars from Gray Line and they went into his warehouse on Little York Rd. behind a funeral home in which he had part interest. Jim was a retired anesthesiologist but he had a huge collection of cars, mostly Packards, and he bought and sold them across the country. I think in addition to us he sold cars to the Wandermans and the Jordans. Anyway, one by one, all were sold except ours-to-be and a '49 lwb Packard. I choose the Queen simply because the mileage was so much lower. The car had actually been sold to an airman in San Antonio first. Jim agreed to a time payment but when no payments came after the down payment in a couple of months, he went to get it. He then sold it to a local a Lone Star Packards couple who put new tires on and did some chrome work and then they lost interest when they found a '47 Clipper. It went back to the warehouse and then entered the Baccaro's. I brought an electric fuel pump and installed it on the driveway between the warehouse and the funeral home and it fired right up. We drove it home and drove it to several LSP meetings over the next couple of months without any problems. Then it developed a blown head gasket. We decided to start the restoration. A complete engine rebuild was done since it had sat for so long in that warehouse and then we moved on to the interior. The wine color is an original color but it was not the original for this car. It was "fawn" but a black car with brown interior did not appeal to me! Several years later it got a paint job. The Queen is really the favorite car in our collection. The kids grew up in it waving to parade crowds from the jump seats and we still use it. On the recent fall tour all seven of the Baccaro's rode in comfort. Interestingly, Packard never intended to build this car, 2222-70, and you will find no references to it in any product planning meetings etc. It was only after the Custom Super 8 was introduced that the decision to build it was made. Commercial customers such as limo services and funeral homes were complaining to the dealers about the cost and the dealers approached Packard about a reduction in the Custom 8 price. They refused but realized they already had the 141" chassis used on taxi cabs ( the Custom was a 148") and they would replace the 288 CID with a 327 CID, add the deluxe trim on the outside, use the custom interior, and drop the price $800 below the Custom. Bingo, they had a "sedan for seven" or a formal limo depending on the configuration preferred well below the Custom price. The plan worked and many were sold to commercial customers just like ours.